Welcome to our monthly blog post where we discuss the cash recovered in each stage of the collection process. We have tried to assign all recovery payments to a specific stage that was set closest to the payment date. While this approach is not always correct in the case where recovery stages are not promptly updated, it gives a very good overview of the drivers behind recoveries. The total amount of cash recovered in May 2018 was €311,166 (+33.4% since last month), a record breaking amount. When looking at the table above, it shows how effective each stage of the process is at recovering cash owed to investors and can help you understand why some stages are more effective than others. If you haven’t already read about our 3-step collection and recovery process and May’s post then we would recommend that you check them out first. The most noticeable change in May was the total amount of cash recovered compared to the previous month, mainly in Estonia and Finland where the amounts increased by 27% and 36% respectively in the bailiff stage. As more court cases reached a final decision in our favor, they were handed over to the local bailiff who began to work on retrieving payments owed to investors from the borrower’s income and assets. We can attribute the success of this process and our record-breaking month to the relentless Bondora recoveries team! Over 99% of the cash recovered in the bailiff stage was in the second segment “The bailiff is working to retrieve the payments owed from the borrower’s income and assets”. Here, the amount of cash recovered increased by +29.7% (+€37,525) compared to the previous month. 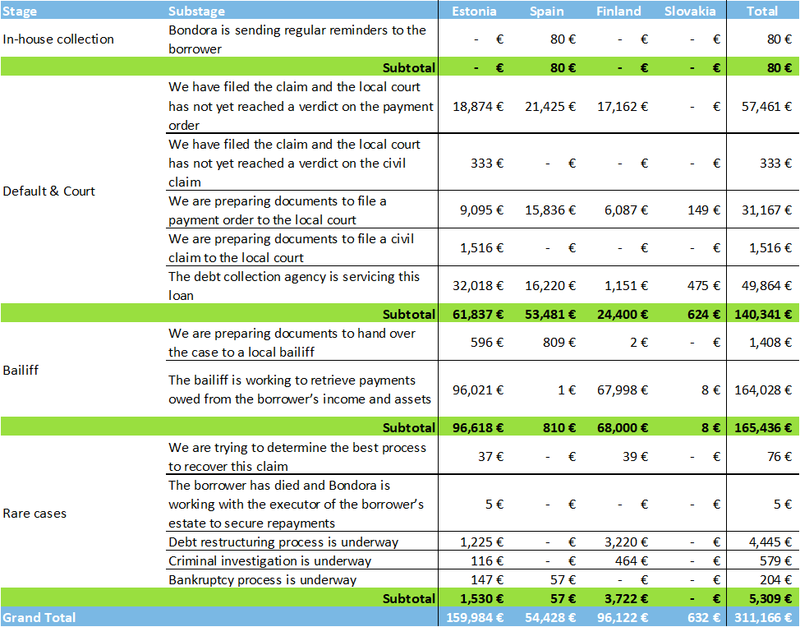 We also saw an increase of 61.1% (+€21,795) in the “We have filed the claim and the local court has not yet reached a verdict on the payment order” stage. In the default and court stage overall, there was an increase of 38.7% (+€39,144).